Style Organize in style with one easy step .The LinJie Jin Decorative Hooks is finished in Beech/Vegetable tanned leather . It is designed to hold a wide variety of items such as backpacks, coats, hats, scarves, purses, bathrobes and towels. 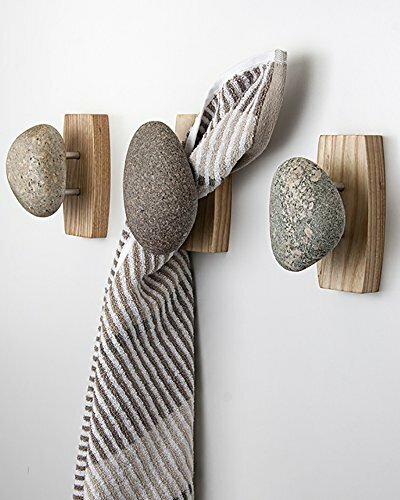 This simple design is perfectly suited for any room from the entryway to the bathroom - even the garage. 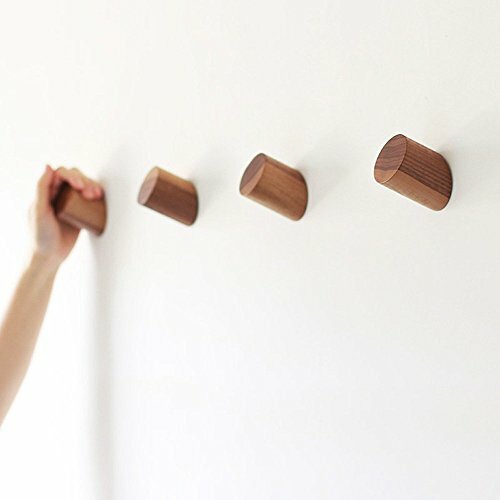 Material The nature solid wood hook is hand crafted and smooth, thus causing no harm to your hand or the clothes; the vegetable tanned leather accessories can be used for hanging umbrellas and other objects. With time passing by, will create a charming sense of vicissitudes; using solid wood without paint, which is more health, environmental friendly, and artistic with natural wood texture. 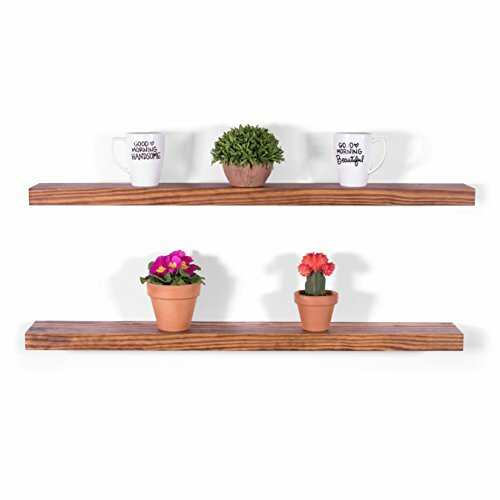 Weight Capacity Solid wood hooks and pedestal are double fixed with screws and glue to ensure its stability. 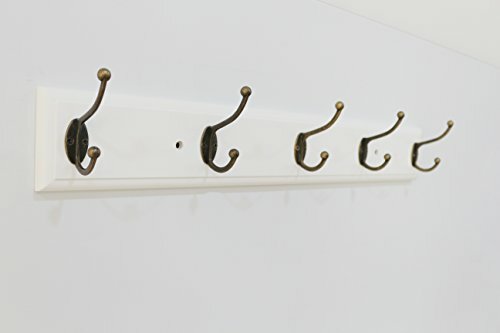 The weight capacity is up to 6 pounds for a single hook when installed on solid wood or walls, 36 pounds for the whole set. 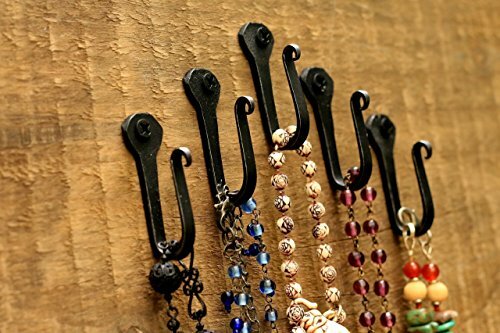 %100 BRAND NEW AND %100 PROTECTION AND %100 MONEY BACK GURANTEED QUALITY Wood Wall Hooks, with exquisite handmade crafts. The main lightspot is painting with natural beech wood oil which is healthy and eco-friendly, not like chemical paiting Another the wood oil can help to heal tiny scratches to ensure each one with high quality. 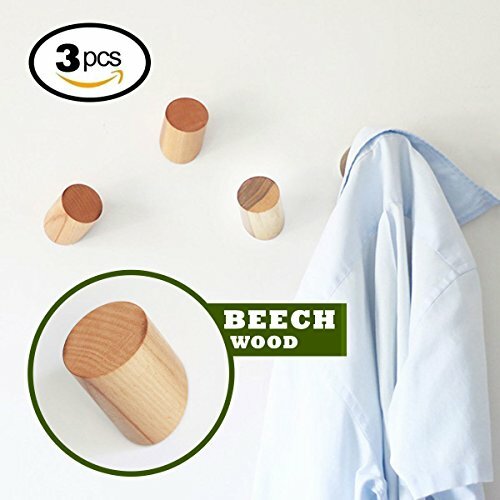 FEATURE Material Option: Best Quality Beech Wood Finish: Oil Size: Diameter 40mm Net Weight: around 0.06-0.07kg/pc Hold Up to: 17kg Accessories: Rivets, Screws Selling unit: 3pcs/lot Easy To Mount 1.Select the location and mark if necessory. Choose a diameter of 8mm. Drill hole depth of about 30mm. 2.Knock the plastic Rivets into the holes, make sure that no loose. Cut off the outcrop to keep flat. 3.Install screws, tighen to the desired angle. ABOUT ITEM The real looks may not be the exactly same as showing in the pictures due to the natural solid wood has unique grain on every unit. Our team should select one by one to ensure each wood hook with good looking, no flaws.What Are You Still Waiting For? 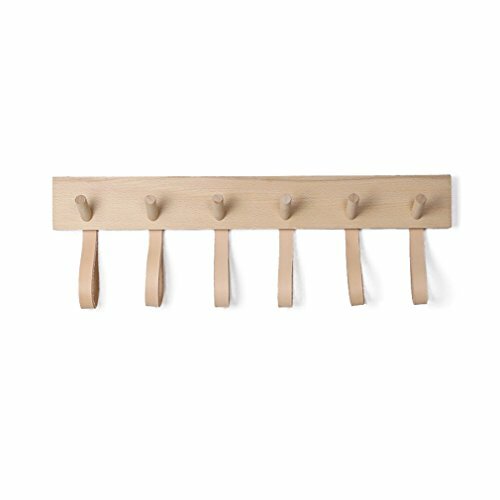 Just click on the "ADD TO CART" button to get this sturdy and durable Wooden Coat Hook and add color to your life! Wrought Iron HooksThis listing is for 2 wrought iron hooks!They Measure 3" inches in length and extend 3" inches from the wall.Two Mounting holes for extra stability.These wrought iron vintage hooks are great for hanging most anything.PlantsHanging LanternsCoat HangersHanging Home DecorLook at our other listings and find other wrought iron hook quanities and lower prices for larger quanities. 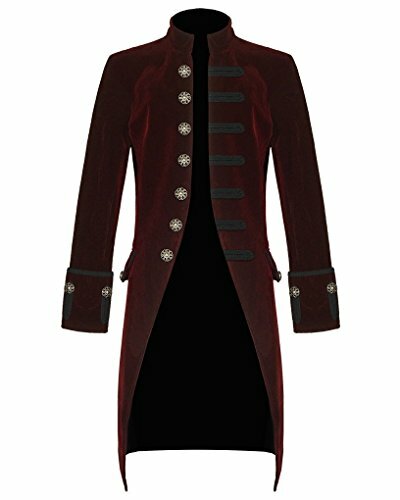 Mens Velvet Goth Steampunk Victorian Frock Coat /Burgundy Color,Front Two Pockets, Zipper on Front to Close the Coat Fabric: 65% Cotton 35% Polyester Vintage style knee-length frock coat in velveteen fabric.Has Black Trim On Front. Open front with mandarin style collar, featuring decorative custom buttons to the right side, and ornate Black military style braiding to the left. Long sleeves with upturned cuffs featuring matching black braiding trim and buttons, finished perfectly with decorative side pocket flaps with button and braiding detail and box pleating to the back. S: Chest- 40". Waist- 36". Length- 39". M: Chest- 42". Waist- 38". Length- 39". L: Chest- 44". Waist- 40". Length- 39". XL: Chest- 46". Waist- 42". Length- 39". XXL: Chest- 48". Waist- 44". Length- 39". XXXL:Chest-50" Waist-46" Length-39",XXXX-L-Chest-52",Waist-48",Length-39"
This coat hooks is a classic design. . It is designed to hold a wide variety of items such as backpacks, coats, hats, scarves, purses, bathrobes and towels. This simple design is perfectly suited for any room from the entryway to the bathroom - even the garage. 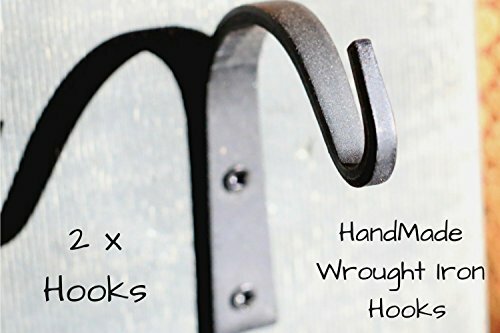 Wrought Iron Hooks- Nail HooksThis listing is for 6- wrought iron nail hooks!They Measure 2" inches in length and extend 1" inch from the wall.These wrought iron vintage hooks are great for hanging most anything.CoatsHanging TowelsHanging Home DecorScrews for mounting included! Looking for more Handmade Coat similar ideas? Try to explore these searches: Asics Casual Shoes, Playscale Miniature, and Wrought Iron Topiaries. Shopwion.com is the smartest way for comparison shopping: compare prices from most trusted leading online stores for best Handmade Coat, Black Gig Bag, Bakers Rolling Pin, Handmade Coat . Don't miss this Handmade Coat today, April 26, 2019 deals, updated daily.